In this solo dining adventure, Kate enjoys one last meal in Miami before heading back to the frigid Northeast. 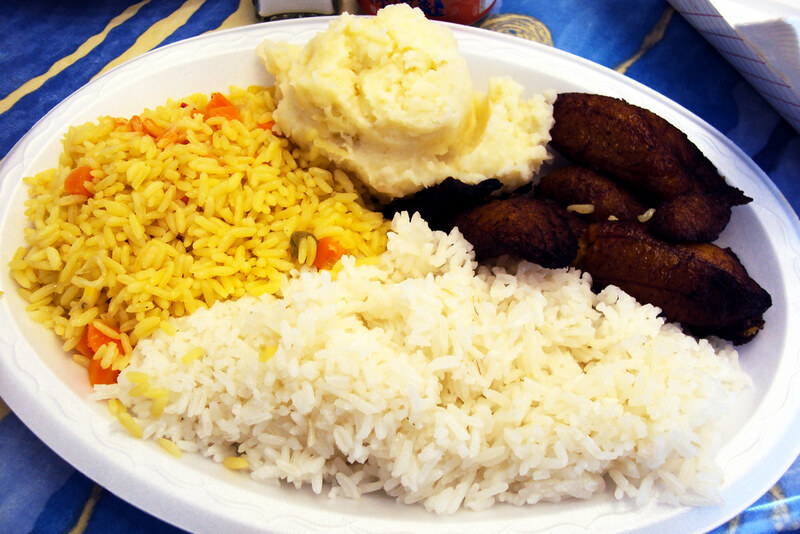 A full plate of food. It was our last night of our weekend vacation to Miami and BF and I were in a cab heading back to our dumpy hotel after our decadent dinner at Michael’s. “You came all the way into Miami from South Beach just for dinner?” our cab driver asked, perhaps thinking we were either crazy or crazy loaded. “Yep” we laughed, and then told him the address of our hotel (which lacked among other things: carpeting, dressers, and conditioner), giving him a clue to the former. Our flight was to depart late the next afternoon and there was still one thing left on our list of “Things to do While in South Beach” — an authentic cuban meal. According to our guide book, the place to go was the Little Havana neighborhood in Miami proper, so we were chatting logistics and figuring out if we had time for another trip into the city before our flight. But according to our cabbie, who must have realized he had some serious foodies in his car and intervened, we didn’t have to venture that far at all. “There’s nothing good in Little Havana anymore” he said with a dismissive wave of his wrist. “Las Olas” he confirmed. “It means: The waves. It’s not fancy.” He glanced at me in the rear view mirror cautiously– could we handle it? I nodded him on encouragingly. A Cuban food recommendation from our Cuban cab driver? A place that we would be in and out without having to order from a menu and sit and wait (a plus when catching a flight)– I was sold. The next day, after sadly packing up our stuff and leaving our bags with the front desk, we set out to find “The Waves.” The end-of-vacation-I-have-to-get-on-a-scary-plane-blues had descended and we walked in silence to our last supper. Although it was in South Beach and walking distance from our hotel, it was definitely off the beaten path. We walked away from the main drag of Ocean Avenue and Collins and Lincoln Road where we had done much of our touristy hanging out. The scenery changed from novelty shops and drugstores to residential, and industrial. This was promising. When we entered and I realized that we were the only English speakers in the place I got excited. This was the real thing. A cheap joint where you order what you want from behind the counter, pay for it and then sit with your soda and chow down. You leave full and satiated, not the least bit pampered or titillated. This was Cuban comfort food and we needed to be comforted. 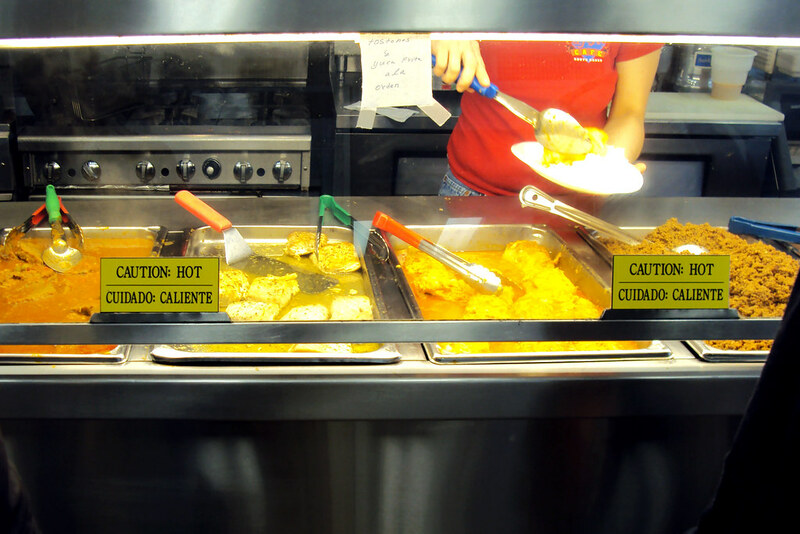 Lining up at the buffet counter and pointing out what I wanted to the Spanish speaking woman was interesting. She seemed amused that we were eating no meat (bf had decided to join me in vegetarian solidarity), and piled high the portions of everything we could eat: white rice, yellow rice with vegetables, and dirty rice with black beans, a generous portion of mashed potatoes for bf (I skipped them) a large scoop of fried plantains for both of us and black beans on the side. We also got a cheese and spinach empanada to split. 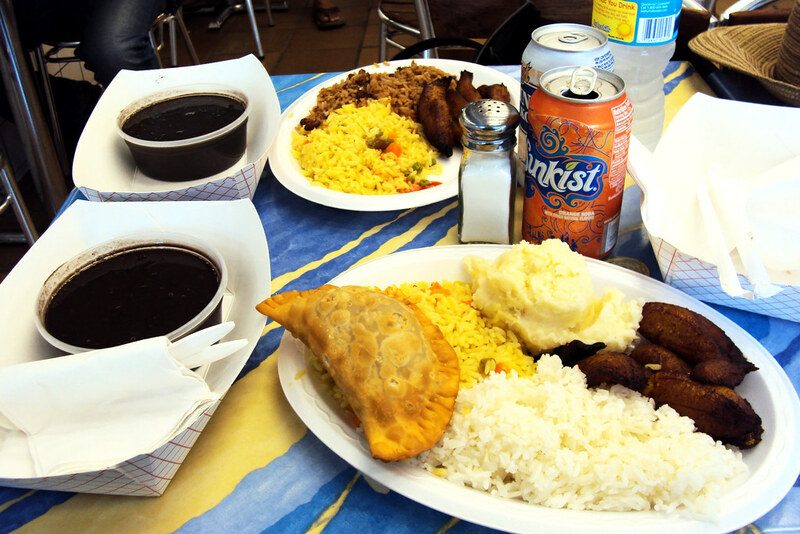 A huge lunch with two bottled waters, two sodas, two heaping plates of food and two empanadas between us, we got out for way under $20. No, we didn’t indulge in the moist-looking, flavorful-smelling chicken or pork that everyone else in the place seemed to be enjoying, but my feeling is that if we had the cost still couldn’t have been much more. BF is full and satiated. And the empanada? Oh, the empanada. We split it in two and butter (or lard?) ran down my hand. I bit in anyway. Wow. I had never had anything like it. The buttery, flakiness of the outer pastry competed with the inner oozing cheesyness of the filling. I chewed savored my half in blissed-out silence. BF finished his feast before I did and I definitely ate past my fullness point. When I finally pushed my plate away with only a few bites of beans and few grains of rice left, we looked at each other. “Me too,” I agreed. “Stuffed.” We looked at each other, happily. “Wanna split another emapanada, for dessert?” I asked. “Yes, ” he said without a half a second’s pause. I wanted to snap another picture of our “dessert” to show the flakey, hot cheesy goodness to readers, but I had lost all self control. It was in my belly before I could switch my camera on. Must Haves: empanadas, fried plantains. Cost: end-of-vacation-the-credit-card-statement-is-seeming-a-bit-more-real: dirt cheap. Ambiance: Corner bodega meets McDonald’s– without the fancy light fixtures or comfortable booths. Beverages: Alcohol is not available, but there is an interesting selection of exotic soft drinks, and not the gourmet ones you find at Starbucks. Flavors loaded with sugar and labeled in Spanish. 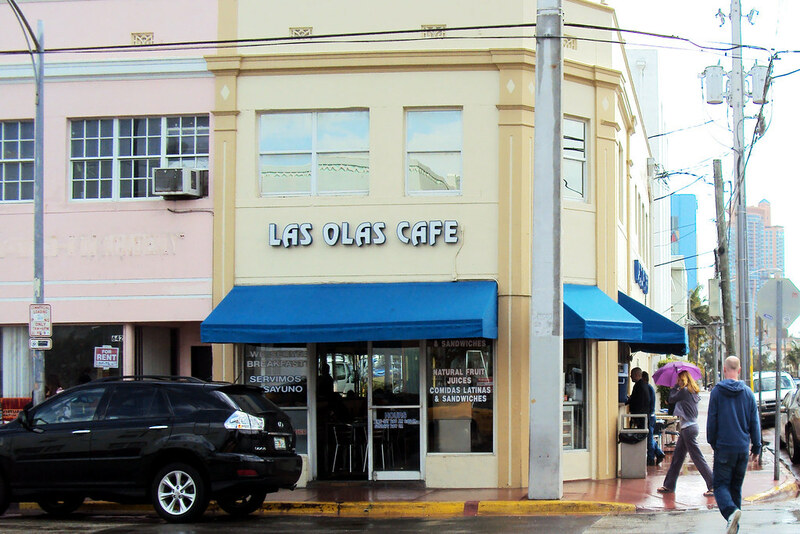 Las Olas Cafe. 644 6th Street, Miami Beach, FL. [Show/Hide Map] (305) 534-9333. Kate — Guidebooks are useful….to an extent, but the locals always seem to known the really authenic/cheap-but-good places to go. 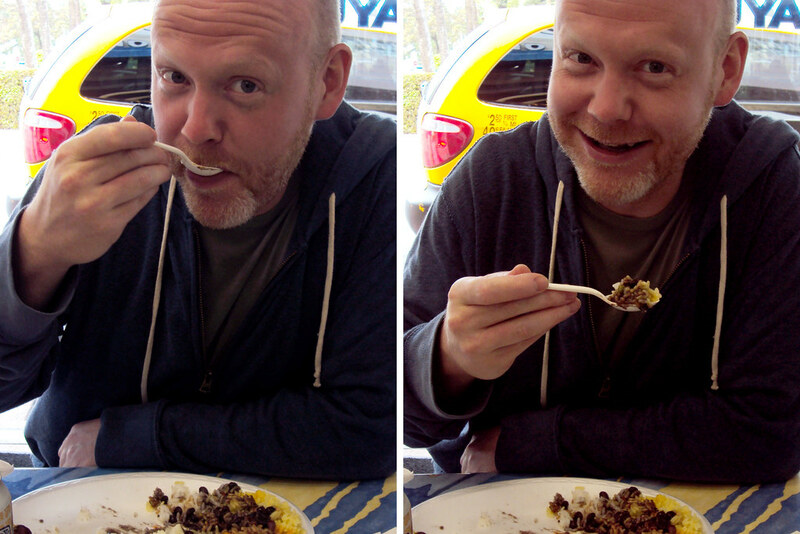 It all looked good to me especially the black beans & rice…..I’m a goner when it comes to anything with rice & beans. Also I kinda like the Spanish name for them: Moros Y Cristanos. BF gets a special “Monday Mike” commendation for passing up the chicken & pork selections and going veg with you….very endearing. You and BF are a hellava lot more adventurous than me…….I’d never get on a plane with such a full stomach. Seems like the only bump in your vacation road was the accommodations….unless it’s a four-star or a well-known chain finding a place to stay is always a leap-of-faith. Better luck next time. Good installment Kate….Thanks.